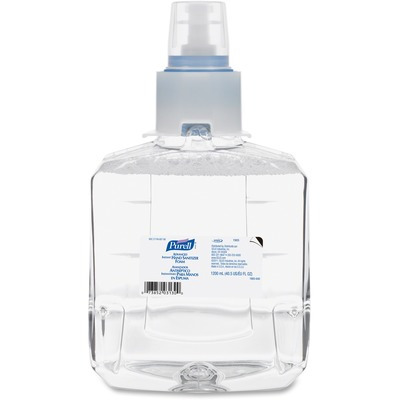 Advanced Instant Hand Sanitizer Foam Kills More Than 99.99 Percent Of Most Common Germs. Patent-Pending, 70 Percent Ethyl Alcohol Formula Is Milder On Skin Than Handwashing And Is Enhanced With Four Different Skin-Conditioning Agents That Help Maintain Skin Health. Controlled-Collapse Refill Bottles Hold Their Shape As They Empty For A More Attractive Overall Appearance. Sanitary-Sealed Refills Are Made Of Durable, Recyclable Pet Material, Using 30 Percent Less Plastic Than Rigid Hdpe Bottles. 1200 Ml. 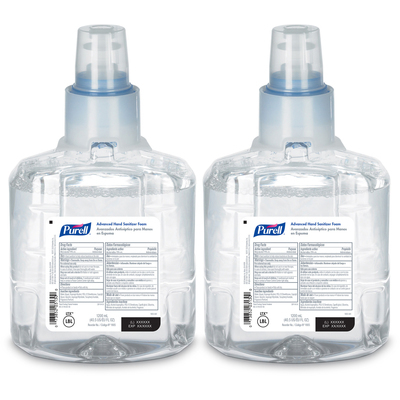 Refill Comes With A Fresh Dispensing Valve And Is Designed For Use In The Purell Ltx-12 Dispenser That Is Fully Ada-Compliant. Removable Pump Promotes Easier Recycling..
Advanced Instant Hand Sanitizer Foam Kills More Than 99.99 Percent Of Most Common Germs. Patent-Pending, 70 Percent Ethyl Alcohol Formula Is Milder On Skin Than Handwashing And Is Enhanced With Four Different Skin-Conditioning Agents That Help Maintain Skin Health. Controlled-Collapse Refill Bottles Hold Their Shape As They Empty For A More Attractive Overall Appearance. Sanitary-Sealed Refills Are Made Of Durable, Recyclable Pet Material, Using 30 Percent Less Plastic Than Rigid Hdpe Bottles. 1200 Ml. Refill Comes With A Fresh Dispensing Valve And Is Designed For Use In The Purell Ltx-12 Dispenser That Is Fully Ada-Compliant. Removable Pump Promotes Easier Recycling.